It is traditional to wake up before dawn and perform this work before speaking to anyone. 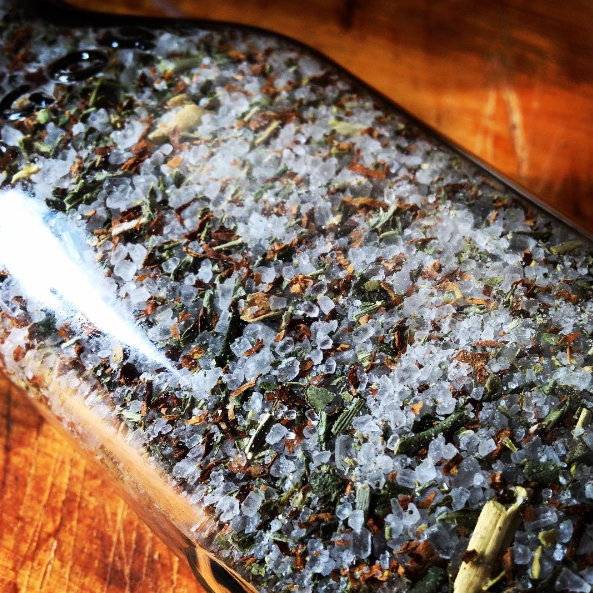 Add a commercial preparation of Uncrossing bath crystals to about a gallon of hot water, steep an Uncrossing herbal blend until the infusion begins to cool, or otherwise make an infusion of herbs and minerals known for their uncrossing and cleansing properties. When it is lukewarm, remove any large bits of herbal matter and take the pot to the bathroom. You may want to light a white candle on either side of the bathtub to create an entryway. After taking your morning shower, turn off the water and pour your prepared bath over your head, or from the neck down. Place the now empty pot between your legs to catch the runoff water. Using your hands, from head to toe, rub your body in a downward fashion. It is traditional to pray Psalm 51 or another Psalm associated with the act of spiritual cleansing. You can also pray these words or similar ones with conviction: “I am cleansed of any and all harmful energies that have attached themselves to me. I am uncrossed and made spiritually clean. Nothing can deter me from my blessed path.” Affirm that you are made clean and new. These should be your first words of the day. When finished, carefully step out of the tub backwards through the threshold created by the two candles. Air dry. Take the pot with the excess runoff water (even a very small amount will do) to a crossroads where two roads intersect in a +. Toss the water over your left shoulder towards the West, stating “I banish this condition and, as the sun sets in the West, so does it set upon my former condition.” Express gratitude to the spirit of the crossroads and walk home without looking back. You may also toss the runoff bathwater on the base of a large tree that seems willing to drain this energy into the Earth. Traditional or not, I suggest offerings of Cornmeal or Tobacco be made to the tree for its help. Excess bathwater is said to hold your former condition and some include it as an ingredient when performing a house cleansing floorwash. When in the process of uncrossing and clearing, be mindful of your personal energy – who you allow into your home, who you shake hands with and come in contact with, old self-sabotaging thought patterns, and agreements you make. Be new. According the physics concept of plenism attributed to Aristotle, nature abhors a vacuum. When energy is intentionally banished or removed, the space it occupied should just as intentionally be filled with something new, lest after our careful cleansing we leave what fills us back up to happenstance. Following any work of uncrossing, unjinxing, or curse removal, work of protection, blessing, or “drawing” should follow. After taking an Uncrossing bath, pray a prayer of blessing over yourself from foot to head, going upwards. You may pray the 23rd Psalm and / or anoint your pulse points with a condition oil to attract or cultivate something of need or desire, such as Crown of Success, Money Draw, or High John the Conqueror. Some folks choose to dust themselves with a drawing or attracting sachet powder in an upwards manner. In the case of using Fiery Wall of Protection condition oil, you could affirm: “I am protected from any and all harm. I dress myself in the armor of God and no weapon formed against me shall prosper.“ Take a moment to bask in the glow of your affirmation. Experience it as already true and be grateful for what has been achieved. Some folks may choose to take an Uncrossing bath for 3, 7, 9, or 13 days depending on the severity of their condition. Through June 23rd, St. John's Eve, I have slots open for readings and divination via e-mail. If you’re looking for actionable divine guidance, magical or spiritual coaching, and / or transformative solutions especially grounded in the pragmatic traditions of American folk magic and hoodoo rootwork, this may be for you. Order yours and e-mail your questions / concerns to info@impactshamanism.com. All readings and divinations are thorough, grounded, empowering, and actionable. With the aid of my helping spirits, divinatory tools like the tarot and bibliomancy, and almost two decades of experience in magical spellworking and root doctoring, we can make real change happen in the areas of your life that matter most to you at this time. Please allow up to one week for delivery of your reading / divination to your inbox. It's one of my favorite words. It's the ability of someone or something to hold or carry something of value. Without capacity, we might end up only skimming the surface of our potential for receiving what we long for. We're only able to fully manifest what we have space for in our lives and, unbeknownst to most of us, our hearts have a huge say in what we have capacity for. The heart is more-than-human. The heart both beats with desire and reveals whether or not we have the courage to take actions towards them. All power is mediated through the heart. We might desire more love, more money, more visibility in life overall - to be seen for not only who and what we are but for our potential to be greater, perhaps, if just given the chance. But with all of these desires, the majority of us are expecting the spiritworld to knock down the walls we've carefully built in response experiences that resulted in pain, disappointment, and disillusionment. We were never taught how central the heart is, how to refresh it, how to clear and re-enliven our manifestation engines. We never learned that yesterday doesn't define today and that our availability to meet the possibilities tomorrow brings is a choice based in the heart. Dragons in Manhattan is a love conjuration, an attraction spell, a cut-and-clear rite, and a blockbuster working all in one. It begins by cleansing, strengthening, and healing the place where you interface with Creation. All power is mediated through the heart and your Divine Right to experience joyful connection with Life is central to this ritual's intentions. Various spirits of land and place from around the world have requested this be performed. As my alliances with these types of spirits have grown over the years, I've come to understand their intimate connection to humanity's terrestrial and cosmic ancestral lines and their investment in our capacity for deep, heart-based engagement with all of creation. Since I was first given the ritual by the spirits involved, signs and omens have followed me for weeks, further encouraging me to share this offering with the public. The title Dragons in Manhattan comes from a short story of the same name written by Francesca Lia Block and found in the book Girl Goddess #9. In it, a young girl named Tuck who lives with her lesbian mothers in Manhattan becomes eager to know who her father is, launching her on a cross-country trip of discovery that expands her notions of love, family, and personhood. Like Tuck's journey, this ritual carries initiatory potential whose effects ripple outwards exponentially from the hearts of the participants. One spirit has said that engagement will "completely shift participants' perspectives about the world at large." Anyone can participate from anywhere in the world by submitting their name for inclusion in the rite. On May 19th, I will take a solo pilgrimage to three (3) power spots on the island of Manhattan in New York City to pray, make choice offerings, and perform additional magical and ritual acts to rouse specifically allied with spirits of land and place toward stimulating movement in our hearts, lives, and ancestral lines. Participants will be able to deepen their engagement in the ritual from wherever they are in the world by performing simple ritual gestures on the day of the ritual. No materials required. Participation in the ritual is $31. To participate, click the button below and include your birthdate and geographical location in the 'Notes to Business' section. You'll receive an e-mail confirmation and additional optional instructions for deepened engagement as the date of the ritual nears. I can't wait to make this magic with you.